Users can click a button to sign in and this will start recording their time. They will remained signed in until they click the sign out button. Restricting users to just this method of adding time means they cannot fabricate hours worked. Current time is calculated on the web server, so if a user changes the time on their local PC it will have no effect. 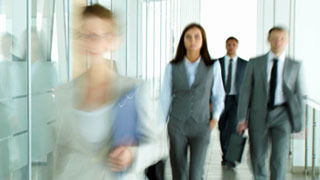 You can restrict the methods available to your employees. For example you may not want to let your employees add time manually to the system since it will enable them to fabricate their time. 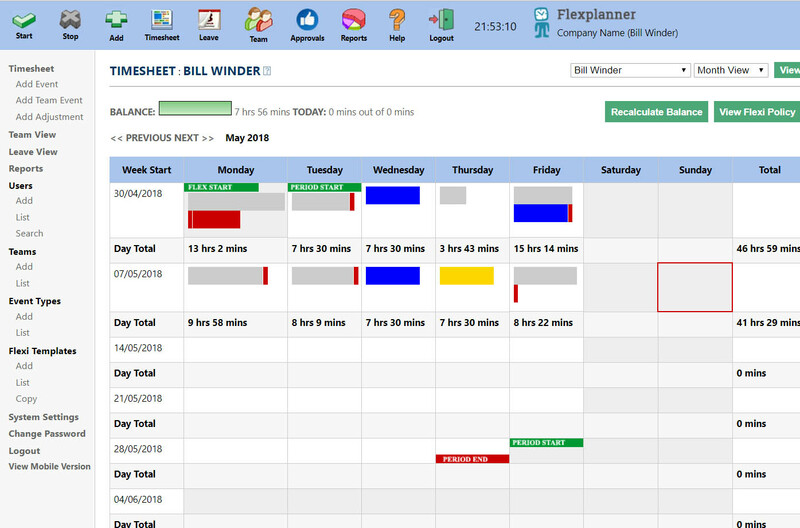 The time sheet view displays all a user’s recorded time by week, four week or monthly periods. At the top of the screen is the flexi time surplus bar which displays a user’s current surplus or deficit. 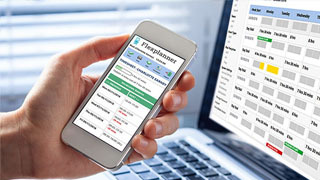 From this screen users can also view their organisation’s flexi time policy, thus ensuring all staff are aware of the rules of the system. 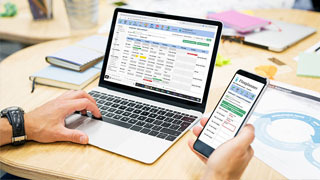 Employees can click on the timesheet to add new time entries, flexi leave or holiday, or to change existing time entries (assuming permissions are allowed). Managers or system administrators can add time for other employees via this screen. 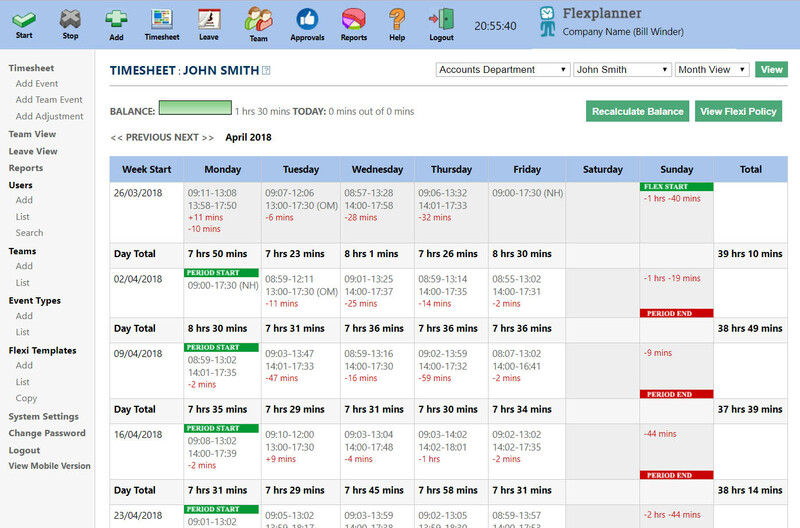 The time sheet view can show total hours work by day and week. You can also view events using a colour coded view. 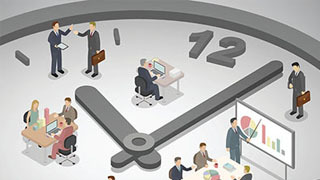 Time templates dictate how employees, both on flexi time and fixed time schemes, enter time into the system. It includes how the user records dates, their time zone, and any time rounding required. The time template also lets you set start end end time adjustments. If you consider that work starts when an employee enters the building you use this to automatically compensate for this. Finally the time template also lets you automatically sign users out at a certain time if they forget to do so at the end of the day. 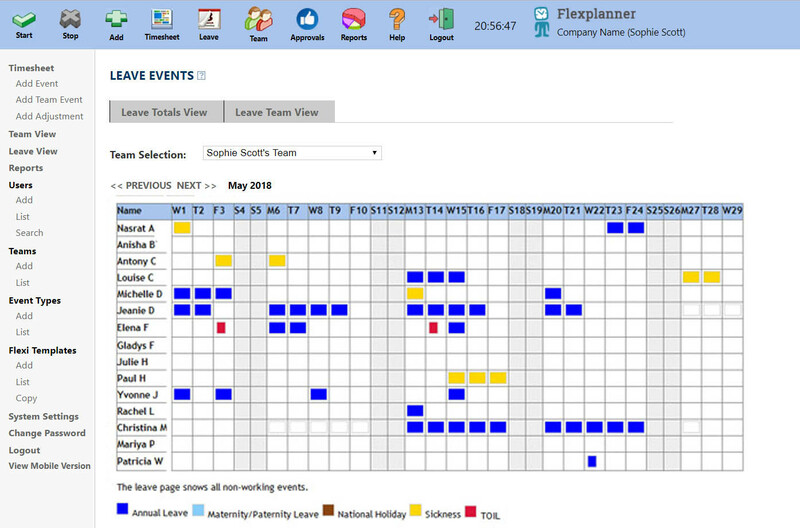 The system can hold multiple flexi time templates for your organisation. 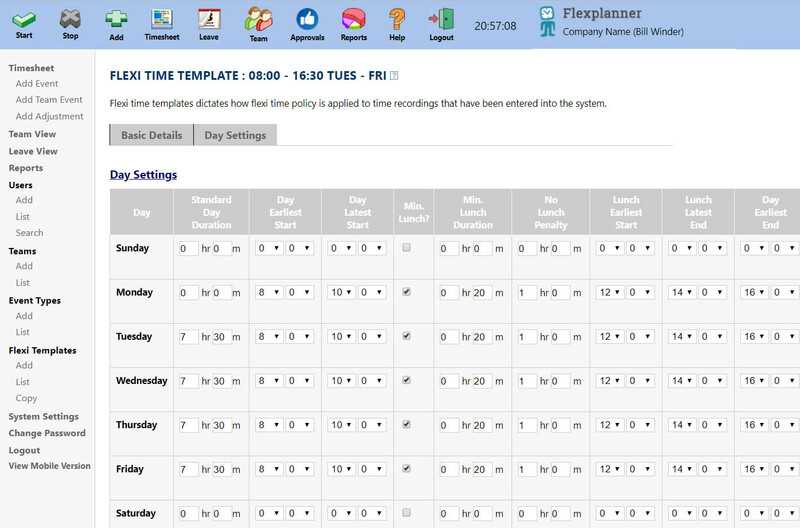 For example if an employee works a 3 day week you can use a different flexi time template. 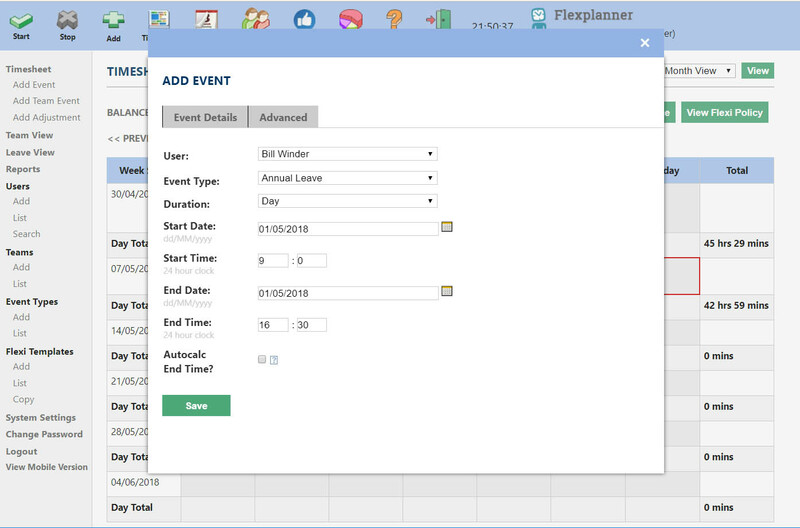 Flex Planner enables administrators to specify a unlimited event types so that users of the system can add them. These can be fixed in duration, for example, for a morning, afternoon or day, or the user can specify their durations. Example fixed event types might be a flexi holiday, annual leave, sickness, paternity or maternity leave.